The 1990s saw a flurry of studies which began to explore equity of resources across schools within districts. These studies revealed significant variation in spending across schools, raising the legitimate concern regarding the effectiveness of state school finance formulas alone for resolving inequitable resources to students. After all, in some states like New York, a single district might serve over 1/3 of all pupils, across over 1,000 schools. Getting enough money to New York City to achieve equity with other districts statewide was one thing, but ensuring that the resources flowed equitably to children across schools within this very large, socially, economically and racially diverse city was another thing entirely. Over the next decade through the late 2000s, within district inequality became a convenient scapegoat issue for federal policymakers, informed by beltway think tanks. The message that emerged was that due to years of litigation and pressure by state courts, states had largely met their obligations to resolve disparities between local public school districts and that the bulk of remaining disparities were those that persist within school districts. Thus, the most useful exertion of federal pressure is on local district officials and their corrupt policies which drive more money to schools in rich neighborhoods within districts, and away from poor neighborhoods within the same districts. The political convenience of focusing on within district equity was that federal policy and funding could be leveraged to place pressure on local bureaucrats – school superintendents and local boards of education – to fix their inequitable budget allocations, regardless of how much money was available. It was a simple, revenue neutral solution, one which avoided federal officials placing any pressure on state legislatures and governors to fund more equitable statewide formulas, which might require raising taxes. These federal policies exist today in the form of “comparability” regulations which require that local school districts can show that poor schools receive resources at least comparable to those of rich schools in order to qualify to receive federal Title I funding. Title I has long required that districts supplement, not supplant state and local resources with Title I funds for high poverty schools. Indeed, it is important that we consider not only the delivery of resources from states to local districts, but also how those resources reach schools and children. But federal attention on within district disparities without regard for between district disparities has created an unfortunate distraction from the larger issue – that many high need school districts simply lack sufficient resources to provide their students equal educational opportunity – and have limited capacity to reshuffle those resources from poor to poorer schools within their highly segregated boundaries. To begin with, assertions that the remaining dominant disparities in school finance are those across schools within district are based on analyses that range from merely insufficient to flawed and outright deceitful. Additionally, the argument falsely presumes that there exist large numbers of school districts around the country that have both rich and poor neighborhoods within their boundaries, and many schools sorted among them. Except in southern states operating county systems, most racial and economic segregation exists across school district boundaries, not across schools within districts. Further, in many states there exist a relative few districts which actually have large numbers of schools and even fewer where there exists large variation in poverty across those schools. In a recent article on the limits of federal comparability regulation, Mark Weber and I explain that 21 states have less than one-half of students attending districts with 10 or more schools. Vermont has none. 15 Fifteen states have more than 1/3one-third of their students attending districts with fewer than five schools (meaning likely fewer than three at any grade level, three elementary, one middle, one secondary, or single high school regional districts). In this same article, Mark Weber and I go further to illustrate that if we look across schools statewide, variations in district spending strongly dictate statewide variations in school spending. We explain that “District spending variation explains an important, policy relevant share of school staffing expenditures in 13 states. In many states, including Illinois and New York, a nearly 1:1 relationship exists between district spending variation and school site spending variation (2).” In other words, if a district has more money, so too do the schools within that district. Bad Example 1: A 2007 study by authors at the Buckeye Institute in Ohio counted up the districts where there existed a positive versus negative correlation between low income shares and per pupil spending across schools within those districts. They found that most of the 70 high poverty districts they studied did not have clear positive correlations between school spending and low income shares. As I explained in a critique of this study, most of what they actually found was that school districts with one or a few elementary schools, a middle school, and a high school a) often had higher per pupil spending in the high school, and b) the high school often had lower shares of children reported as qualifying for free or reduced lunch. 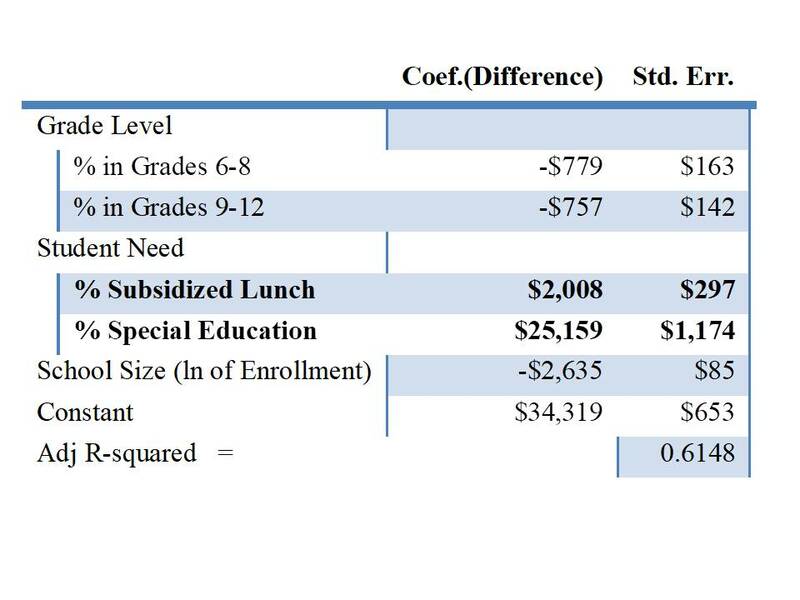 This was an important revelation to me at the time, since this is a common pattern, with a variety of explanations including lower compliance filing forms to qualify for subsidized lunch at the secondary level. But it’s not evidence that Ohio districts were shortchanging higher poverty schools to favor lower poverty ones. Bad (really stupid) Example 2: A more egregious example comes from a New York based charter school advocacy organization called Families for Excellent Schools which released a report arguing that New York City’s highest funded middle schools were also its worst! The press release for their report proclaimed: “At the middle school level, the bottom 50 schools received an average $30,256 per pupil, compared with $16,277 at the top 50 middle schools.” The goal of their report was to advocate that these funds should instead be directed toward charter school expansion, since it was clear, by this finding, that the district simply didn’t know how to leverage resources to improve student achievement. But this “study” missed the simple fact that in New York City like most large districts, the primary driver of differences in spending across schools within districts is the share of children with disabilities served in the schools. Children with disabilities significantly influence staffing ratios and thus school level spending. It also turns out, not surprisingly, that schools with more children with disabilities tend to have lower average test scores. Thus, more spending leads to lower test scores? So then, what’s the right approach for characterizing good and bad disparities across schools within districts? Through numerous peer reviewed publications and consulting work with colleagues including Jesse Levin at the American Institutes for Research, we have arrived at a common set of factors that should typically be included in any model of within district, school level spending variation. First we must consider the grade level issue, both because there exist differences in spending approaches across grade levels and differences in student need measures, such as free or reduced lunch. 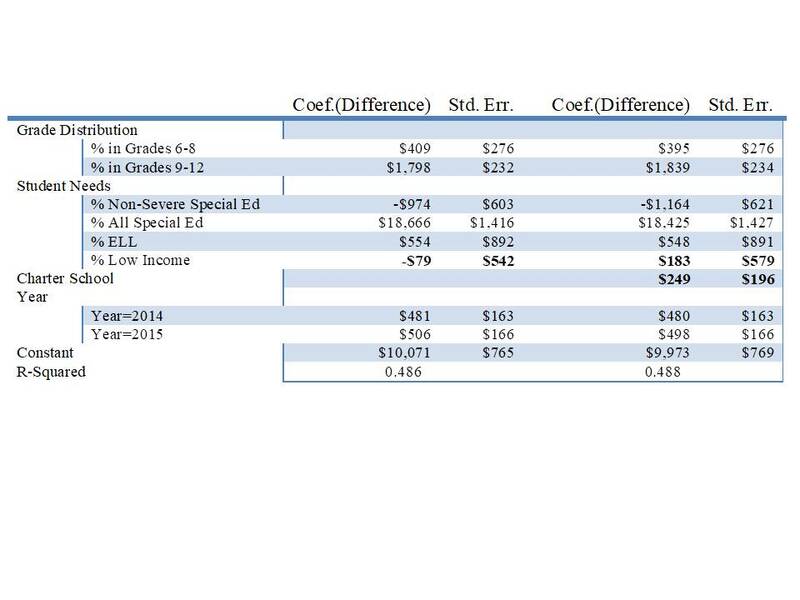 It’s not that we have any real basis for assuming that elementary school costs more than high school or vice versa, but that direct comparisons ignoring grade level are problematic and can lead to invalid conclusions (like the Buckeye report). 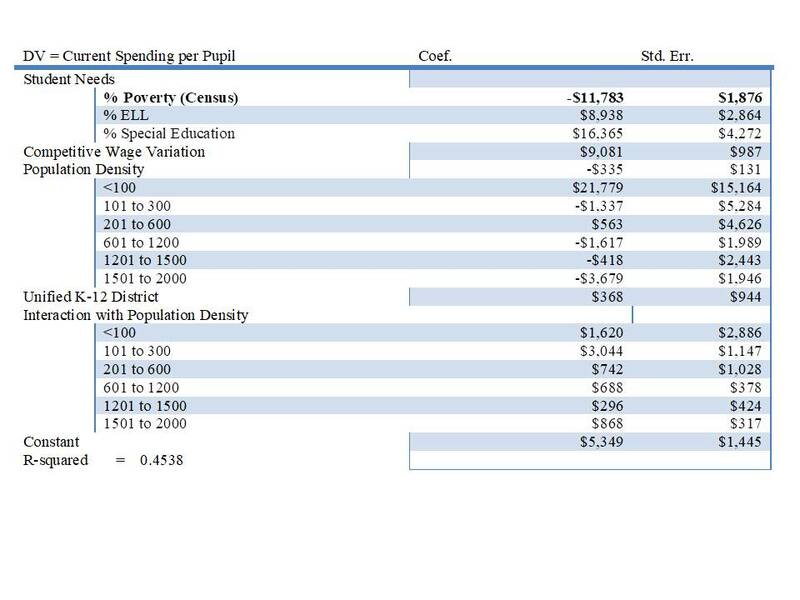 While we consider district size and population sparsity in our School Funding Fairness model evaluating district spending, one can make the argument that there should not exist inefficiently small (higher spending because they are small) schools in densely populated urban contexts. Having these schools for some drains resources from others. It’s inequitable variation, not equitable variation. Perhaps most importantly, we must consider the distribution of children with disabilities across schools, preferably with consideration of which schools are serving children with more severe disabilities requiring even more direct instructional and related services support personnel. Let’s apply these guidelines to take a look at school site spending variations in New York City and Baltimore. Table 1 and Table 2 present results of regression models of school spending in New York City and New York State. It’s important to understand here that I’m just using these models to characterize the average patterns across all schools in each district. Often, statistical models like this are used for drawing inferences about relationships. These models are simply describing patterns – actual patterns, across all schools. For New York City, for example, I find that as we go from 0% to 100% children in middle grades, per pupil spending drops by $779 per pupil. As we move from 0% to 100% children in secondary grades, per pupil spending drops by $757. That is, elementary per pupil spending tends to be highest in New York City. The average regular elementary school spent about $21,229 per pupil in 2015. As we move from a school with 0% low income children to 100% low income children, spending increases by about $2,000 (about a 10% margin). If we went from a school with 0% children in special education to 100%, spending per pupil would double. Most schools fall between 0 and 30% special education, so the practical difference is about 1/3 of the $25,159. Importantly, these factors explain over 60% of the variations in spending across New York City Schools. That is, most of the variation in spending across New York City schools is rational, explainable variation. Still, a sizeable share is not, and should be vetted further. 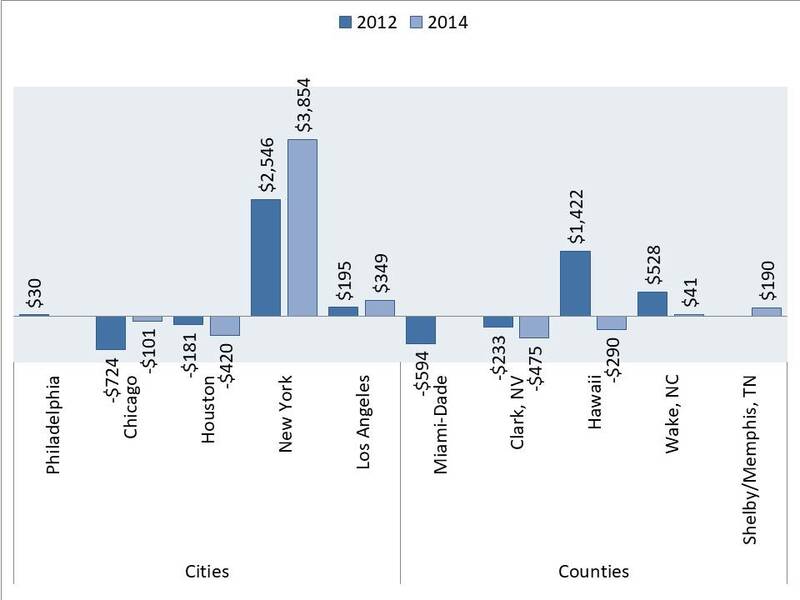 By contrast, Table 2 shows a model applied to statewide, inter-district spending variation in New York in 2015. Here, I also include factors for regional wage variation and for economies of scale and population sparsity. As such, this even richer model should be able to explain even more variation if that variation is rationally related to cost and need factors. But, the state level model only yields about 45% variation explained by rational factors. More disturbingly, however, the state model reveals an overall statewide pattern of regressive inter-district disparity, wherein a district with 100% poverty would be expected to have nearly $12,000 less in per pupil spending than a district with 0% poverty. So, at least in New York State, spending disparities within New York City are less of a problem than spending disparities statewide. New York City intra-district funding is mildly progressive whereas statewide inter-district funding is regressive. Now let’s take a look at Baltimore, where I include two different models. The New York City analysis above does not include charter schools. The Baltimore analysis does. In an equitable district/charter system, after accounting for the relevant factors, there should not be any difference in spending between charter schools and district schools. Otherwise, charter schooling in-and-of-itself is introducing inequity. Baltimore, unlike New York City does spend more in schools serving more secondary level students. Again, the margins of difference related to special education are the greatest, but are somewhat buffered where the shares of students who have mild disabilities is greater. In the first model, it would appear that on average, schools serving more low income children have lower per pupil spending. That is, Baltimore school funding is flat to regressive. But, when one takes account of charter schools, what we see is that charter schools, on average, spend slightly more ($249 per pupil) than otherwise similar district schools and that spending with respect to low income children is slightly progressive ($183 per pupil increase moving from 0% to 100% low income). The reason this pattern flips when accounting for charter schools is that a) Baltimore charter schools serve, on average, fewer low income students than do district schools and b) Baltimore charter schools spend slightly more per pupil than district schools. That is, they introduce an inequity to the system. This finding is common. In ongoing work, Mark Weber, Ajay Srikanth and I are finding that across large school districts which have sizeable and growing charter sectors, student sorting by demographics is exacerbated and school spending variations increased. That is, expanded chartering seems to be leading to increased inequality across schools within common geographic spaces. Using data from two waves of the Civil Rights Data Collection, we again find that controlling for the factors listed previously, New York City charter schools continue to spend far more than district schools serving similar populations (Figure 1). Results are mixed for other settings, but inequities are inequities, in whichever direction they fall. Focusing for the moment specifically on New York City – as I show above, New York City, across public district schools has achieved greater equity than New York State has achieved across districts. In fact, one of the most significant factors compromising equity across schools within New York City is the expansion of charter schools! Worse, the extent to which charter expansion adversely affects equity for children within New York City is difficult to measure accurately in the absence of a common financial reporting system inclusive of all revenues and expenditures for school sites, including the value of allocated services. Tightening comparability regulations governing within district equity (defined in terms of progressiveness) while pushing for expanded choice and diversification of operators and governing bodies are entirely incompatible policies. In some states, charter schools are governed by and financed through local district budgets, providing the opportunity for districts to use common formulas for funding district and charter schools. In other states, fully independent charter schools may be authorized to operate within district spaces but outside of their control or financing. Some states like Texas have both. Expanding the mix of providers and provider types in a common space is more likely to result in increased variations in quality and spending than in convergence toward equity. Private providers have widely varied access to outside resources, resulting in highly unequal “revenue enhancement.” The incentive for school operators is to pursue whatever means is necessary to be the preferred school of choice (for the preferred students), not to spend only what is needed to provide equal opportunity to achieve common outcomes. Hall, Daria, and Natasha Ushomirsky. “Close the Hidden Funding Gaps in Our Schools. K-12 Policy.” Education Trust (2010). Spatig-Amerikaner, Ary. “Unequal Education: Federal Loophole Enables Lower Spending on Students of Color.” Center for American Progress (2012). Baker, Bruce D., and Kevin G. Welner. “Premature celebrations: The persistence of inter-district funding disparities.” Education Policy Analysis Archives/Archivos Analíticos de Políticas Educativas 18 (2010). Luebchow, Lindsey. “Equitable Resources in Low Income Schools: Teacher Equity and the Federal Title I Comparability Requirement.” New America Foundation (2009). Dynarski, Mark, and Kirsten Kainz. “Requiring school districts to spend comparable amounts on Title I schools is pushing on a string.” Evidence Speaks Reports 1 (2016): 21. See also: Dynarski, Mark, and Kirsten Kainz. “Requiring school districts to spend comparable amounts on Title I schools is pushing on a string.” Evidence Speaks Reports 1 (2016): 21. Baker, Bruce D., and Mark Weber. “State school finance inequities and the limits of pursuing teacher equity through departmental regulation.” education policy analysis archives 24 (2016): 47. Baker, Bruce D., Ken Libby, and Kathryn Wiley. “Charter School Expansion and Within-District Equity: Confluence or Conflict?.” Education Finance and Policy (2015). Weber, Mark, and Bruce Baker. “Do For-Profit Managers Spend Less on Schools and Instruction? A national analysis of charter school staffing expenditures.” Educational Policy (2017): 0895904816681525.